The colors are vibrant in this side. We do weekly menu planning 'round here. Keeps the food bills in control and minimizes trips to the grocery store. Tonight's dinner was penned in as "chicken, veg, starch." I had my mind set on the chicken; brined breasts and bbq'd with a light coat of sauce. Nothing fancy. Kid loves it. The veg and starch were left open. I often leave these two parts of the meal open to give me a bit of flexibility during the week. I had an idea to collapse the starch/grain and vegetable. Traditional tabouleh is a great side; the blogosphere and traditional sources abound with recipes despite its simplicity. 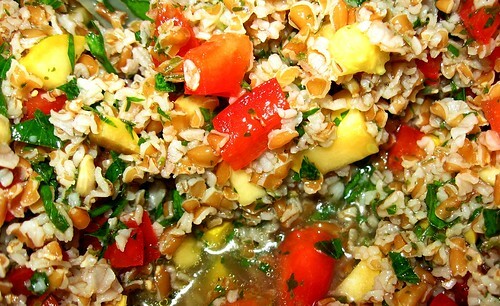 The critical components of tabouleh are: hydrated cracked wheat, LOTS of parsley, mint, olive oil and lemon juice. Breaking from a traditional tabouleh, yet keeping these critical components, I came up with this version based on what was in my fridge. It provided a nice all-in-one healthful, summer side for our chicken. It was served on a bed of spinach, a sliced tomato (also on the side) and, of course, the bbq'd chicken. A special summer meal. There is a critical balance between the olive oil, lemon juice and salt. The quantities in this description are only a starting place. You'll have to keep tasting until it's to your liking. Mix everything at room temp, cover in wrap and let sit in fridge 12-24 hours in advance. Serve slightly chilled. Keeps nicely a couple days at least.